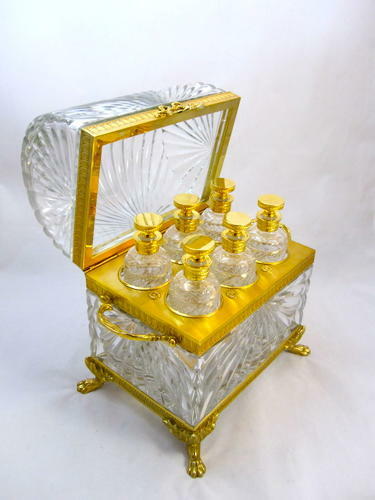 Monumental French Cut Crystal and Gilt Bronze Domed Perfume Casket. The Crystal is Chiseled into Radiating Lines Pattern and Sits on 4 Dore Bronze Paw Feet. Six Cylindrical Perfume Bottles with Dore Bronze Mounts are Encased in this Exceptional Double Handle Perfume Casket. Wonderful Quality and Size - WOW !